Businesses that work with heavy-duty equipment or machinery that relies on hydraulics for high-performance and operation will eventually have to replace hydraulic hose assemblies to keep everything working as it should. Replacement intervals as a preventive measure for costly and hazardous failures is a standard method used across many industries. Custom hydraulic hose in Fall River can be ordered and purchased through Metro Industrial & Marine Supply in New Bedford. We proudly serve customers throughout the Southcoast region, across the country, and around the globe. Our custom hydraulic hose assemblies can be created while-you-wait or picked up later with same-day service, in most situations. Over time, hydraulic hose assemblies and the elastomeric seals used on the various hose fittings and adapters will age, wear, deteriorate, and harden due to regular use. Even if the most pristine conditions and temperature controlled environments, deterioration and wear will occur under the thermal cycling and compression set. All hydraulic hoses and assemblies should be inspected and replaced at specific replacement intervals, according to government or industry requirements, as well as manufacturer recommendations. Businesses should also replace hydraulic hoses whenever unexpected wear and tear is noted to prevent a costly failure. Failures should be avoided at all costs. Failure of hydraulic hose assemblies, while the machinery or equipment is operational, can result in severe or life-threatening injuries to operators, employees, and visitors within the area. Failures can also result in costly downtime, requiring the machinery to be inoperational until a proper cleanup and replacement of custom hydraulic hose in Fall River can be performed. In addition, depending on the pressure, environment, and fluid being used, failure can also result in expensive damage to the equipment or machinery itself. If a hose failure does occur, it is essential to shut down all of the equipment immediately and leave the area until the pressure has completely been released from the hydraulic hose assemblies. A simple shut down of the hydraulic pump may not be enough to eliminate the pressure in your custom hydraulic hose in Fall River, as pressure can remain if check valves are engaged within the system even if the pumps or equipment is not operating. A complete shutdown of the entire system should be performed for safety purposes. If there are tiny holes in the hose, which are known in the industry as pinholes, a very small, yet extremely dangerous, stream of hydraulic fluid can stream out. This can cause serious injury to the operator, employees or visitors, which could result in death. When it comes to Fall River hydraulic hose services, you can never be too careful or cautious. It could take anywhere between several minutes or hours for the pressure to be fully relieved so the hydraulic hose assemblies can be examined safely and an employee can replace hydraulic hoses. You should never attempt to repair or patch a hose that has failed; it must be replaced. 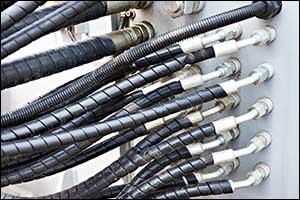 Whenever you are working with hydraulic hoses, assemblies, and hydraulic fluid, caution is essential. Hydraulic power is accomplished through the use of high-pressure fluids to transfer energy to the machinery to do work. All of the elements contribute to this transfer of energy by conveying the fluids at high rates of pressure. Any type of fluid under pressure can be seriously dangerous and has the potential to be lethal if an injury occurs. Even an injury that looks minor could be life-threatening. Companies that regularly work with hydraulics should ensure that there is an urgent care, emergency room, or physician in the local area that can effectively identify hydraulic injuries without delay. Not all clinics and hospitals are equipped to handle this type of injury. If you do not replace hydraulic hoses at the proper intervals, you are more likely to experience a catastrophic failure. There are other things that can causes failures, such as misapplication, abuse, extreme working conditions, and failure to perform proper maintenance. Businesses that work with hydraulic equipment or machinery can come to Metro Industrial & Marine Supply in New Bedford, MA for custom hydraulic hose assemblies. We can create custom solutions based on your needs and specifications while-you-wait or offer same-day service for most orders. Make sure to replace hydraulic hoses whenever you suspect that there may be an issue or on a timed replacement interval according to industry, government, and manufacturer specifications. Contact our team at 508-996-8400 to place an order for custom hydraulic hose in Fall River and the surrounding area. We are also proud to be the premier choice for all of your industrial and marine supply needs in the Southcoast area. Call today to learn more about our professional services and options for hydraulic hose assemblies and other essential industrial equipment.